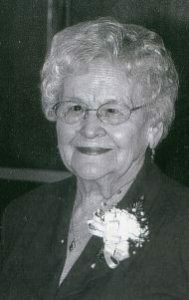 LEWISTON – Lucienne M. Cloutier, deceased us on Dec. 16, 2018, at the age of 97 ½. Born in Manchester, N.H. on May 3, 1921, but raised in Canada by her father, from the age of 13 months old. Her mom predeceased her. Her parents were Joseph, Anna (Bergeron) Marcotte. She was schooled in Canada and moved to Maine in 1937. There, she met the love of her life, Wilfred A. Cloutier. They got married on Dec. 18, 1937, at St. Rosaire Church, Sabattus. They had 76 ½ years of marriage together, until his passing on May 28, 2014. She worked in textile for a few years, and then opened her own janitorial service, until her retirement. She loved to cook and entertained many of her relatives and friends. She also went dancing for 40 plus years every Saturday night. Her hobbies were crochet, knitting and reading. Predeceased by her husband; parents; and many good friends. Survivors are cousins. We want to especially thank the hospice care for granting her wish to pass at home. Visitation will be held Thursday, December 20, from 4-7 p.m. at Fortin/Auburn, 217 Turner Street, Auburn. A Mass of Christian Burial will be celebrated 1 p.m., Friday, December 21, at the Basilica of Saints Peter and Paul. A committal service will follow at the St. Peter’s cemetery in Lewiston. Please visit www.TheFortinGroupAuburn.com to leave condolences.